Dungarpur, the 'town of hillocks' is located in the southern part of the state of Rajasthan. According to historical records, it was formerly the capital of a princely state ruled by the Bhils. Today this small town has lost much of its past glory and is a bustling place. It is a perfect getaway for those who like enjoying the smaller niceties of life. Here is a guide to the scenic town. The Dev Somnath Temple is dedicated to the Hindu deity Shiva and is situated on the banks of the River Som. According to locals, this ancient temple was constructed during the rule of Vikram Samwat in the 12th century. 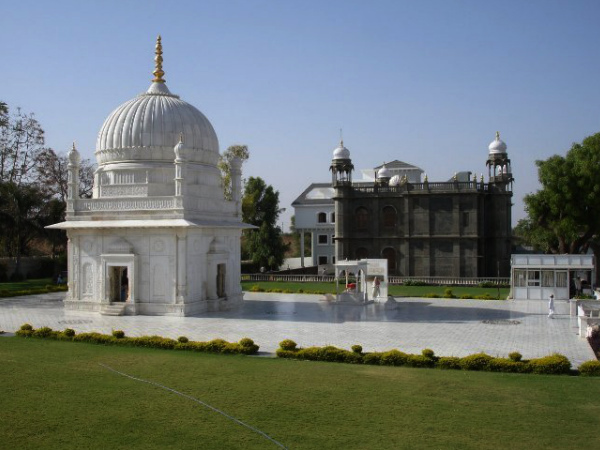 This temple is made of white stone which gives an attractive aura to the whole structure. Tourists can see several inscriptions on the walls of the temple. Badal Mahal is renowned for its intricate architectural designs and is located on the banks of the Gaib Sagar Lake. This palace displays a fusion of Mughal and Rajput architectural style. Dawra stones were used in the construction of the palace. The monument has two stages, three domes and a verandah. The domes have half ripe lotus shaped designs on their tops, adding to the beauty of the entire structure. Travellers coming here can explore the palace and marvel its architecture. Srinathji Temple is an ancient shrine which was constructed in the 12th century and is dedicated to the Hindu deity, Lord Krishna. The idol of the deity was beautifully carved out of black marble. It is also interesting to know that the Srinathji Temple is considered as the second richest Indian temple after the Tirupati Temple of Andhra Pradesh. Devotees from all over come here to worship the lord and seek his blessings. Travellers coming here can pay homage at the temple and also admire the architecture of this place. Galiakot is a hamlet located on the banks of the River Mahi, at a distance of 58 km from Dungarpur. According to beliefs, the village derived its name from a Bhil Chieftain who ruled the area. Galiakot is famous for the Syed Fakhruddin shrine. Syed Fakhruddin was a renowned saint who after his demise was buried in this village. This holy centre was constructed using white marble and stands out as a brilliant piece of architecture in the region. Travellers can see the intricate designs on the dome of the shrine. A large number of devotees of Dawoodi Bohra visit the shrine on the occasion of 'Urs', which is held every year on the 27th day of Muharram. Tourists can also see Vijia Mata's Temple, Vasundhara Devi Temple, and Sheetla Mata Temple in Galiakot. Juna Mahal is a beautiful palace constructed during 13th century. This building has seven storeys and its architectural design resembles that of a fort. The walls are adorned with mirror and glass works. Tourists can also see several picturesque miniature paintings and frescoes on the interiors of the palace. The place has turrets, corridors and a narrow entrance. By Air: The Maharana Pratap Airport or Dabok Airport of Udaipur is the nearest airbase to Dungarpur. This airport is connected to major Indian destinations like, Delhi, Mumbai, Hyderbad, Jaipur, Jodhpur and Ahmedabad. By Train: The nearest railway station of Dungarpur is situated in Ratlam of Madhya Pradesh. This station is well connected to major Indian destinations like Delhi, Mumbai, and Chennai by frequent trains. By Road: Tourists can reach the destination by government buses from Udaipur. Private and luxurious buses are also available from nearby cities to Dungarpur.